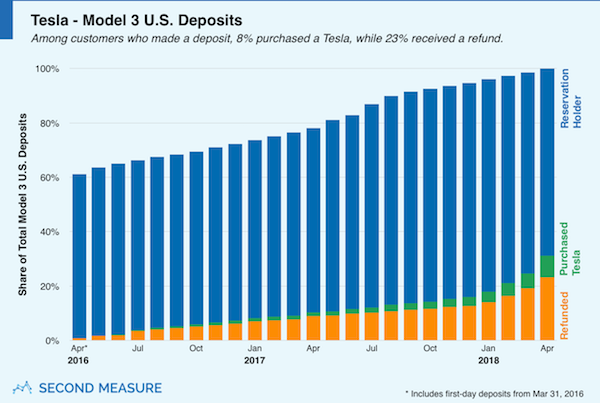 A third-party analysis alleges that 23 percent of customers to place reservations for the Tesla Model 3 electric sedan have requested refunds. The claim comes from Second Measure, a business data analytics company. 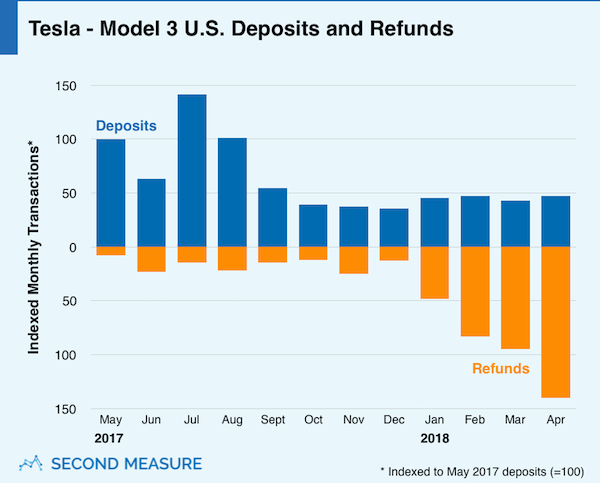 According to data gathered with its own software from billions of transactions, and a track record of accuracy to Tesla's own self-released figures, the company was confident claiming refunds account for 23 percent of all Model 3 reservation outcomes, versus 8 percent receiving their vehicles. Information from the company's own charts also suggests that refunds outstripped new reservations for the first four months of the year, reportedly returning customers' $1,000 deposits at twice the rate it receives them. Second Measure cites production delays as a major driver of fleeing deposit holders, which have been a thorn in the automaker's side for months. No data for the month of May was included. When contacted by The Drive, however, Tesla denied Second Measure's figures, with a spokesperson stating, "this does not line up with our data." The spokesperson pointed to Tesla's own first quarter shareholder letter for semi-current reservation figures, which were then in excess of 450,000. In its production press release for the same period, Tesla stated that its net reservations "remained stable," attributing any customer refunds to "delays in production in general and delays in availability of certain planned options, particularly dual motor AWD and the smaller battery pack." Some of these wrinkles are gradually being ironed out, and Tesla CEO Elon Musk stated an intent to escalate production of the Model 3 to 6,000 cars per week by the beginning of June, with its assembly lines rolling cars off at all hours of the day. Likewise, Tesla made its all-wheel-drive and Performance Model 3 options available to order in May, with deliveries of these vehicles planned for July. Our own Lawrence Ulrich, however, is concerned that Model 3 reservations may dry up with the pool of cash offered by the federal electric vehicle tax credit of $7,500, which will lay the full burden of the base Model 3's $35,000 price tag on consumers, many of whom signed up for the discounted $27,500 Model 3. Whether volume production of the Model 3 or the end of the tax credit arrives first depends on legislators, though public utilities and automakers alike are pushing for the credit's retention. The Italian two-door will also be available as a hybrid.